A few years ago, I was having difficult time of my life. I had recently separated from my husband, was managing as a single mother with two small children at home, and having some unhappiness related to my career when I turned on the TV and happened to see a show that inspired me. Dr. Phil wasn’t a show that I normally watched at the time, and truthfully, it’s not one I watch on a regular basis as I don’t generally appreciate the sensational nature of most of the topics of the show. I have absolutely nothing against Dr. Phil – I respect his position and I actually think he’s a very smart man. I also very much appreciate the efforts of his wife Robin to forward the issue of domestic violence and to help people who have been in the very position I found myself in. But on this day, Dr. Phil was talking directly to me. And he made sense. According to Dr. Phil McGraw, you can trace your life path from the beginning to who you are today to three types of external factors which he calls your 10-7-5. I want to start off by saying that Dr. Phil has apparently expounded on this concept in his book, Self Matters. I have not read the book, and am no expert on Dr. Phil’s theories or on the subject of psychiatry in general. But what I understood from the show that day, according to Dr. Phil, we have no control over these external influences, our 10-7-5, but we can determine our reactions to them. For example, a child who suffers abuse can use the abuse as an excuse for drug abuse, homelessness, or other choices that bring them down – or that child can use that situation to make themselves stronger and more determined to make their life what they want it to be. How many stories do we hear each day which go either way? Really – that’s what my blog is all about. We have no control over the “surprises” that life throws at us, we only have control over the way that we manage them. I don’t know why the show left such an impression on me. I don’t even recall who the guest was, but I decided to sit down and figure out what path my life had taken. I’m not going to tell you about my defining moments or my pivotal people in this blog…but I will tell you about what I feel are my 7 Critical Choices…This is actually the second time I’ve done it – and some of the decisions which once seemed pivotal have now changed completely – as I’m in a different phase in my life. These of course are choices I’ve made for myself – so they start when I started making decisions for myself, as I was on the cusp of adulthood. 1) As I was finishing up the first half of my second to last year of high school, I realized that I had enough credits to apply to university. I sought guidance, but my grades were high enough for me to apply, and I was working part-time and tiring of high school drama. I lived in a university town, so I could continue to live at home and have that support. So I took a chance and was accepted. This decision above all others started me on my path to adulthood Working taught me responsibility – gave me a taste of where I wanted my career to go (although I never ended up where I thought I would). I’ll admit, I chose the safe path. By living at home, I wasn’t taking any risks. Choosing to start mid-year meant I wasn’t exposed to the “frosh” world of my contemporaries. I didn’t make any life-long friends in university. As it ended, I met the man who would become my first husband. 2) Deciding to marry my first husband. Again, it was the safe choice. I didn’t have a lot of experience with men. I was at a crossroads in my life – school was over. I didn’t have a job yet. I had a bachelor’s degree, but I didn’t have marketable job skills. For various reasons I won’t expand upon here, I wasn’t I didn’t know where to go. And I didn’t look very far. I take ownership of this decision. I knew before the marriage that there were problems but naively thought that they were correctable. Yes, I was one of those women who thought I could change my husband. I don’t look at it in a negative way – it changed who I was, and I made some of my critical choices because of it. It put me on the path to where I am today. It made me understand what kind of person I would ultimately need in a life partner. And most importantly, as a result of this decision, two people are now a part of this planet and following me on my path until they’re ready to start making their own critical choices. 3) Deciding to work for my mother’s employer. Another safe choice. Following your parent’s path as it’s been laid out is always safe. I’ve worked there for 15 plus years now. I have a good stable job for a good salary. I’ve been able to take 3 years maternity leave at almost full pay. I have contributed to what should be a good pension when I retire. It’s been flexible enough to allow me to deal with the things I need to deal with related to the children and my divorce. I’m not doing what I expected to do, but I’m comfortable saying that I enjoy my job now. And more importantly, this path led me to the love of my life. 4) Now my next decision…some would say it was very risky compared to the first three. Leaving my husband while six months pregnant, with a two-and-a-half year old in tow, was risky. For me and my children however, it was the safest choice I could make. I actually made the decision before I became pregnant, but it was the pregnancy that strengthened my resolve. I didn’t make the decision lightly but I was living in an untenable situation. I lost who I was in that marriage and felt trapped. In leaving I was able to rediscover who I was, and that I’m a strong, independent person who can take care of herself and others. 5) Compromising on the divorce. Another risky decision. But after a multitude of court battles, and arguments that seemed like they would never end, the family court judge spoke to both of us. His basic message was – the whole process of splitting up a marriage is messy – particularly where there are children involved. You have two choices. You can wait to the end and have the judge decide what’s going to happen – but neither of you are going to be happy with it. You’re better to try and compromise with something you can live with and get on with your lives. And so that’s what I did. I was lucky – my ex wasn’t incredibly sharp, and I don’t think his lawyer really liked him very much. I compromised on a schedule that appeared to work in his favour – with the proviso that I would be the children’s primary caregiver, and as such be responsible for all of the final decisions related to the children’s care. I can see how this might seem the easy way out. And perhaps it was. I’d worked for a family court lawyer. I knew that unlike in the past, father’s rights are now championed by our legal system – especially if they’re willing to fight for them. I knew without proof of actual physical abuse, the likelihood of being able to gain full custody was unlikely without endless financial resources. To be clear – my biggest concern was more related to emotional abuse. There are very few ways to prove that in court. My ex has been diagnosed with generalized anxiety disorder, but there’s a host of underlying conditions that likely includes OCD, narcisisstic personality disorder, sociopathic tendencies. I couldn’t fight these without a diagnosis. Even with a diagnosis, he would likely still fight and keep fighting until neither of us had any financial resources left. I knew that he’d use the court as a battle ground because I’d taken away his ability to fight me and belittle me in his own home. I made the right decision. I got out of it with a little bit of my dignity in tact. My finances certainly still took a hit. He continues to battle me – but now I choose not to engage unless I need to. 6) Deciding to open my heart again. This was a very difficult one for me. After my experiences, I was very raw. I had been very inexperienced before I met my ex. After the birth of my daughter, and given the divorce battle was ongoing, it took me over a year to even think about dating again. When I was ready, the emotional side of any relationship scared me. But I was a woman in my thirties, and I had certain physical needs. So that’s where I started. A string of no-strings-attached relationships. A couple of friends with benefits (former coworkers) who I knew weren’t looking for anything more. A few online daliances with men I was sure weren’t looking for an attachment (in some cases because they were already attached). Yes, some in the latter group were a bit risky in hindsight. But in my view, safe choices because they came without emotion. They allowed me to figure out what I was comfortable with and what I wasn’t. Until I became physically attracted to someone in my workplace. Risky – given our need to work together at work. If it hadn’t worked out, both of us could have had issues at work. I was in a new phase at work, and saw it taking me further away from that physical workplace – and more importantly I saw him as a match both physically and intellectually. One night out couldn’t hurt really. I thought he could handle the type of relationship I thought I needed. I was wrong. Both about what he could handle, and about the type of relationship I needed. The first night led into the second which led into the third. To my absolute surprise, after all the dalliances which I did not bring to my doorstep, I was bringing him home to my extended family after a month and a half. Shortly after that, I introduced him to my children. And they all loved him. And when he first brought up marriage, about two months in, to my surprise, I didn’t say no. Because of all of the choices I’ve made in my life, I learned that I was a very strong and independent woman. I learned that I need a strong man in my life – who is able to match me both intellectually and physically. I need a man who can help me to make the decisions I need to make and supports me when I need to make them. He is aware of my limitations – but more importantly, he challenges my abilities. Instead of putting me down, he challenges me to aspire to new heights. And I hope that I do the same for him. And thankfully, as a result of this relationship, a new life has begun. Not just ours together with my two children, but also the newest love of my life – our son born six months ago. OK Liv…that’s six – you said there were seven. I’m sure that there are. I don’t think I’ve made the seventh decision yet. I think that’s further down my path. You can see some of the path my life has taken. I’m sure there are other critical decisions that I’ve made…but these decisions and the sometimes surprising results that took me in directions I never dreamed and have helped me to discover who I am. I have a good career – but it doesn’t define me. I now know that I’m a good wife and a good mother who would do just about anything for my family. I’m very happy with the path that I’ve chosen. And I’ve discovered that as I become clearer about what defines me as a person, I’m in a better place to be able to decide what is best for me next time. I regret nothing. I continue to choose to be surprised and delighted both by what life sends my way, as well as appreciating that the path I’ve chosen is making me into the person that I am and will be. More importantly – I urge each of you to examine your own lives – either using this format or another – but come to an understanding of the challenges life has thrown at you and the results of the decisions you’ve made. Be at home with them. Learn from them. 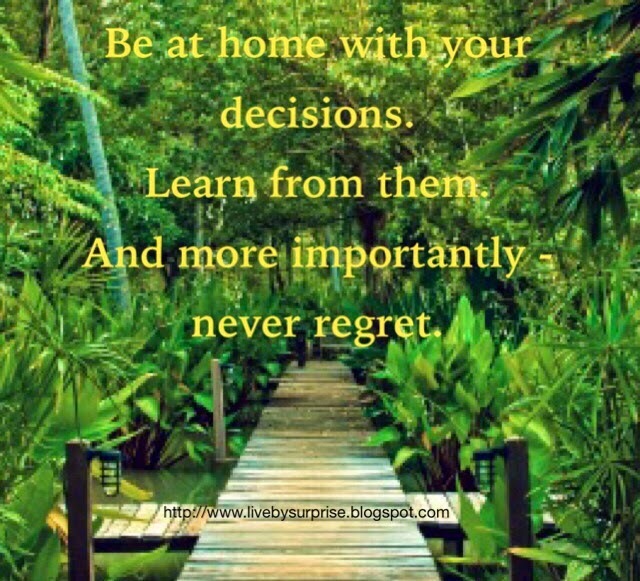 And more importantly – never regret. Live your life by surprise and appreciate that it’s made you into who you are.